Average Weight	: 9 - 16 lbs. Poodles are supposed to have originated in Germany, where it is known as the Pudel ~ German for "Water" dog, which they were developed to be. We know that Poodles were originally developed in either Russia or Germany, not France. However for years it has been regarded as the national dog of France, where it was commonly used as a retriever as well as a traveling-circus trick dog. In France it is known as the Caniche, or duck dog. It is known that this breed has been around for at least 400 years throughout Western Europe. Despite the conversey France has now been officially recognized as its country of origin. The Poodle's distinctive looks have made it a popular subject for paintings, dating back to the 15th century. In the 18th and 19th centuries, the Poodle could be seen in circuses throughout Europe and America performing a variety of tricks. The French artist Henri de Toulouse-Lautrec did a series of drawing and paintings of the breed. The Toy Poodle was breed down from the Standard and Miniature Poodle. This breed has become one of the most popular dog breeds ever. •	Calm disposition, not a ‘barker’, unless encouraged by a nervous owner. •	A great apartment/condo dog. Toy Poodles are a very energetic, intelligent, and elegant appearing small dog. While the standard Poodle has a high playfulness with other dogs the Toy poodle is a little less enthusiastic. Of course this is just in general and depends on the environments in which they are raised. They can be shy with strangers and should be socialized as a puppy. They tend to love children interaction with their owners. 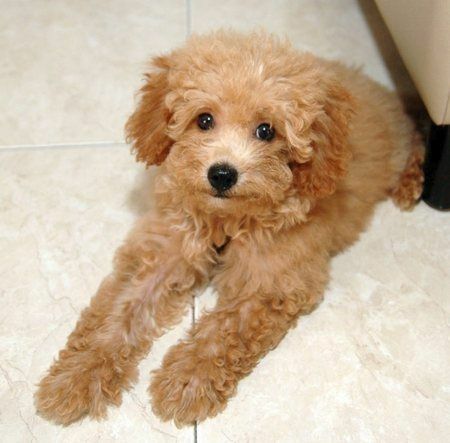 The Toy Poodle is not considered as a "yappy" dog. They will bark to defend or warn their owners but tend to be more reserved then other small toy breeds. Although they are high in excitement they don't seem to be a destructive type when left alone. Some dogs when left alone at home can damage items out of boredom or anxiety. This tends not to be the case with Toy Poodles as long as they get sufficient amount of exercise and companion. Some bloodlines may be high strung and are more liable to react nervously to new circumstances. Generally Toy Poodles are devoted to their family and have a friendly, cheerful disposition. Appearance is a big part of this breed. They need to be bathed regularly and clipped every 6-8 weeks. Toy Poodles shed little to no hair, which makes them a great option for allergy suffers. There are various types of clipping styles for Toy Poodles. "Puppy Clip" is a Toy Poodle under a year old with the coat long the face, throat, feet, and base of the tail are shaved. Some may chose to have a pompon on the end of the tail. "English Saddle Clip" the face, throat, feet, forelegs, and base of tail are shaved, leaving puffs on the forelegs and a pompon on the end of the tail. There are two shaved bands on each hind leg. The rest of the body is left in full coat but may be shaped in order to insure overall balance. "Continental Clip" in this clip the face, throat, feet, and base of the tail are shaved. The hindquarters are shaved with pompons on the hips. The legs are shaved leaving bracelets on the hind legs and puffs on the forelegs. There is also a pompon on the end of the tail. "Sporting Clip" face, feet, throat, and base of tail shaved, leaving a scissored cap on the top pf the head and a pompon on the end of the tail. The rest of the body and legs are clipped or scissored to follow the outline of the dog, leaving a short blanket of coat no longer than one inch in length. The length of hair of the legs may be slightly longer than the coat. Even though this as a very activate and enthusiastic dog, the requirements for exercise can be easily meet. Not only are walks a great way to get out energy and also indoor games work well with this breed. Retrieving comes naturally to most Toy Poodles. Water retrieving may be ok to some but seems more to suit larger Standard Poodles. Depending on their temperament to water this is also a great way for the Toy Poodles to get exercise. Interaction is a must for these dogs. Walks, playing games, or learning new tricks is a great way to keep these dogs in good spirit. This is the star trait for this breed. There ability to learn almost most anything has done a lot to keep its popularity high throughout all these years. In circuses it was trained to learn skills such as walking on its hind legs, skipping, performing card tricks, and even playing dominoes. Training techniques that work well for Toy Poodles include treats, toys, and most importantly praise. Because of their personalities rewarding with praise is a great way to get them to learn new tricks.